I thought you would like that one when I saw it on one of the parking charge Facebook groups. I think it helps prove the lack of human intervention once these things get rolling... From ANPR cameras that can't provide accuracy through to miss-types replacing amounts with something that bears a resemblance to a date... ... 17.09.2015 perhaps? To put the date instead of the amount on their own letter? Did these people go to school, or just play truant? Please let it go to court! I wonder what the court fees on this would be. Also, doesn't this make it a little awkward when they claim money for completing these forms, which haven't been compiled by a human? What are the court fees for a claim of over £17M? Wouldn't be dealt with at county court level that's for sure. Probably an error in a mail merge. A pretty clear case of harrassment I think- demanding an amount which bears no possible relation to any amount in dispute. Hardly. No court is going to take a harassment claim for something like this seriously. It's an obvious admin error, and if followed by a claim would almost certainly be struck out on the court's own initiative. Indeed, it's a very minor error and could be dealt with easily by a token punitive fine from the court, perhaps a mere 10% of the mis-claimed amount. Who could argue with that? But that would only be for £11m, around £6m out of pocket!! Yeah, wait until a week next Thursday. They are still using the old address for Gladstones; so more likely, this is DRP messing up by using the wrong paper.! 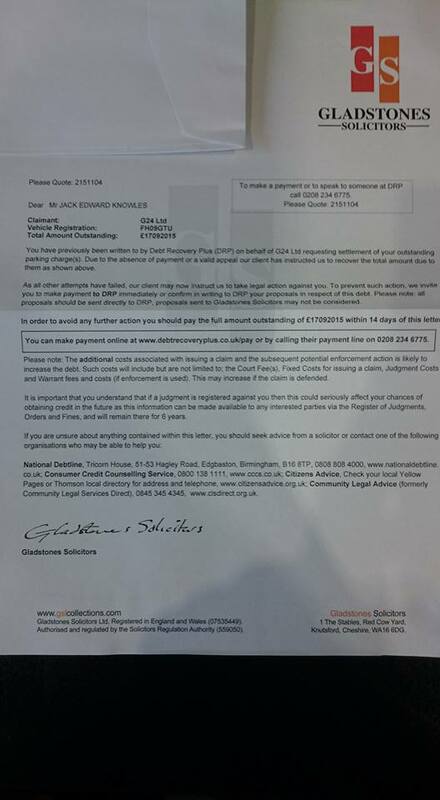 Another one reported on MSE by poster called mad-as-hell on 14th November - this time for £15m. Same originating PPC, and Debt Recovery Plus.